It’s a beautiful pre-summer day and there were some fresh looking sardines at Intermarché in Realmont. A bit early to be thinking “summer lunches” but we need cheering up, so I bought three each–juicy ones–and butterflied them. We had them baked with a simple fennel salad which cuts the richness of the sardines. 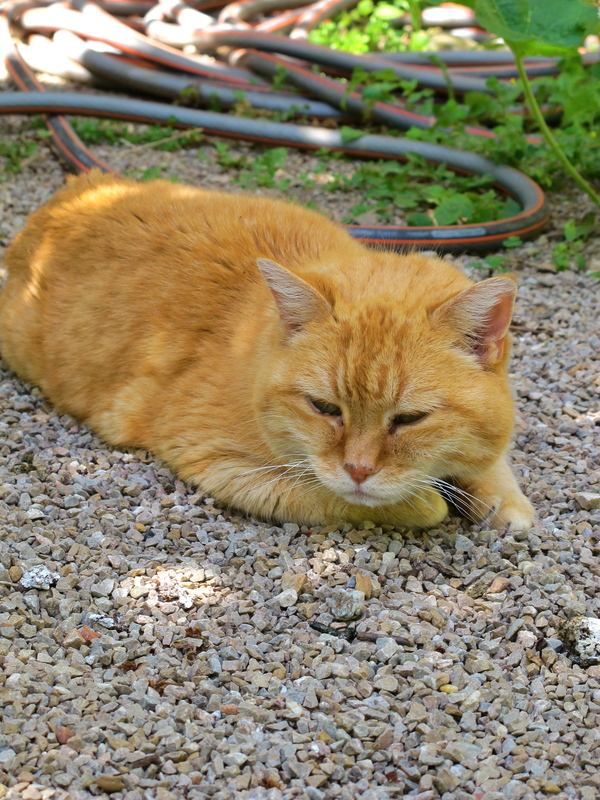 Butterscotch is still not well–in fact poor mite–she’s worse and so thin. She wants to eat and to go on as usual and doesn’t understand why she can’t. 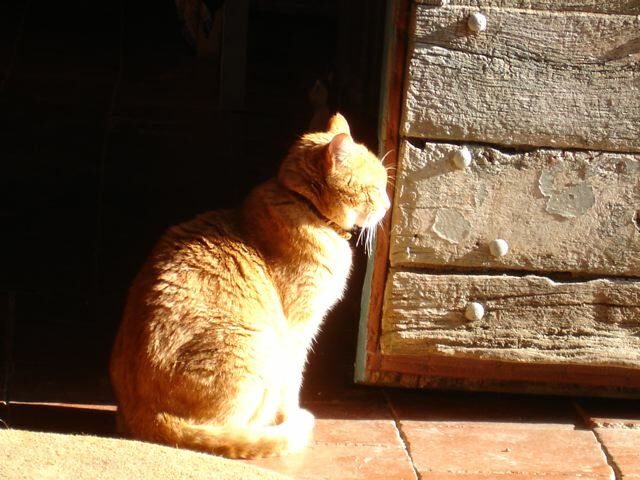 She came out into the garden this morning while we did the exercise routine with our friend Flo and was “with us”–as cats often like to be. Going over to Flo she did one of those wonderful cat “rolls” they do for you– “it’s a greeting” Meredith says. She managed it and even did a return roll–that lifted our spirits. She is twelve now and some systems seem to be failing her. “On s’attache”–“you grow fond”–of your pets and it’s hard. Here’s the recipe to cheer you up after reading this!! Heat the oven at 180°C/350°F/Gas Mark 4 if using. much of the flesh with it. Voila! You have a butterfly fillet. Using a brush if you have one it spread it with a tablespoon of oil. Place the fillets on the tray. 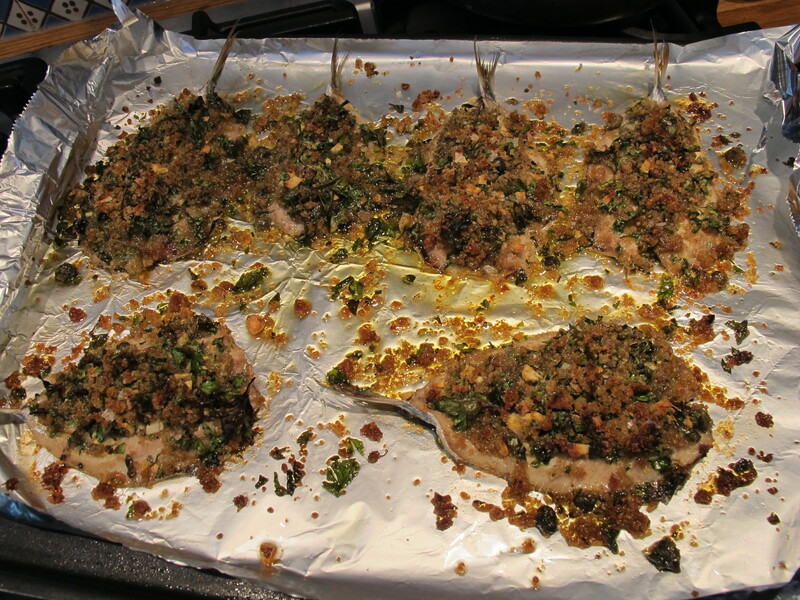 In a bowl combine the breadcrumbs, parsley, garlic, capers, oregano and season with the salt and pepper. Pour over a tablespoon of olive oil and mix it all together thoroughly. 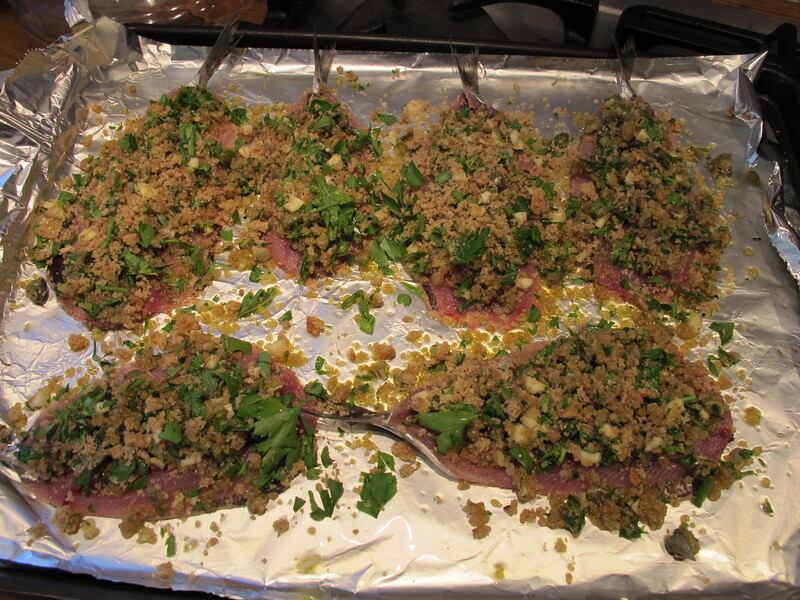 Spoon the mixture evenly over the fillets. Drizzle over the remaining olive oil adding a little extra if you feel it needs it. I let them have a minute under a hot grill this morning to finish off.